The Avatar Selection on this forum is . 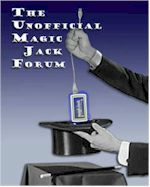 . .
magicJack Field and WPS team "magicJack"
Class Action Law Suit is in the works. JUST SAY NO TO AT&Tea ! Home based Cloud. Anyone tried "Tonido" on a TC? Hmmmmmmmmmmmmm 911 charges on the horizon? How are you running MJ now?